There is nothing more exciting than planning a home improvement project. Okay, perhaps I’m exaggerating a tad. Or more than a tad. It is exciting, though. To consider options, plan and choose. It’s a little less exciting when you find out that your shower needs to be ripped out because the leaks are corroding the wood under the floor, water is leaking into the basement, and it’s all deteriorating. Oh, and you need to choose the tiles and hardware for the replacement work tomorrow. Yes, 24 hours. I took to Pinterest and spent hours and hours searching for showers I liked. Keeping in mind that I had to match the walls and existing floor, it was still fun to check out the possibilities. In the photo, the middle tile is our current floor. The small tiles will be the new shower floor. 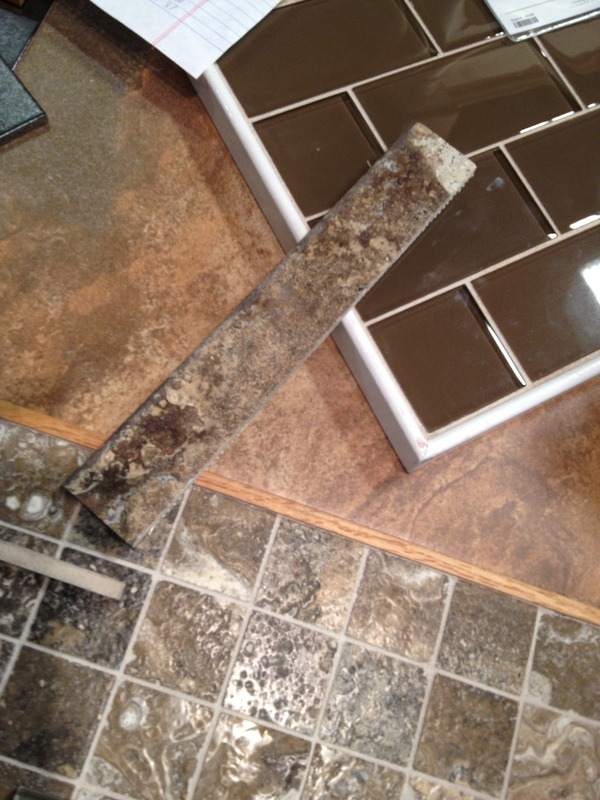 The brown glass tiles are the shower walls and the thin tile is the finishing border. It’s going to look a lot different than our generic orange-y, beige-y square ceramic tiles. Thanks – it’s really coming together nicely!